Nebulae are interstellar clouds of gas or dust that appear as patches of light through a telescope, or, in the case of dark nebula, as black amorphous silhouettes blocking the light from background stars or other luminous background nebulae. Many of the brightest nebulae in the night sky are listed along with other deep-sky objects in the Messier catalogue. Dark nebulae are clouds of dust and gas that do not emit or reflect light (at least not in the direction of the Earth), so they are visible only when they block the light from luminous background objects, such as stars or other luminous nebulae. 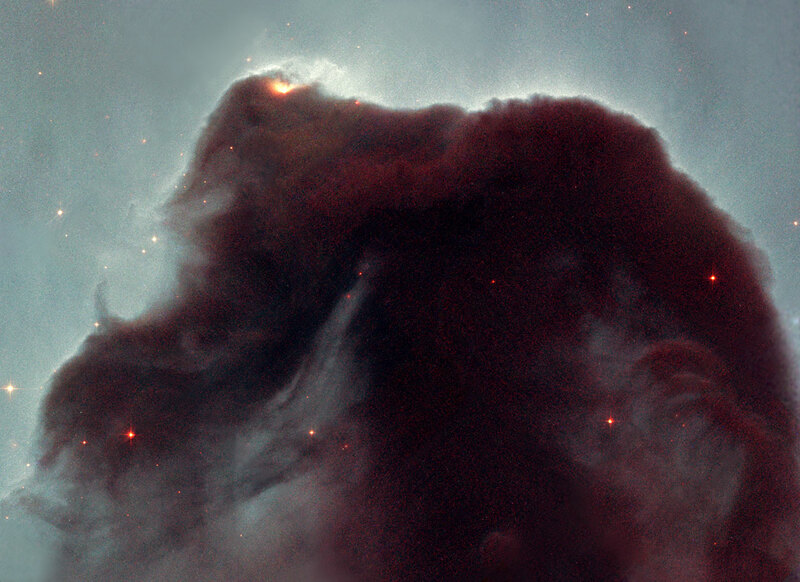 The Horsehead nebular in Orion and the Coalsack nebula – visible in the southern skies to the unaided eye, as a dark patch against the Milky Way – are good examples of dark nebulae. Reflection nebulae are defuse nebulae so called because they appear to glow by reflecting the light from nearby stars. The nebulosity visible around the Pleiades – an open star cluster in the constellation of Taurus – is an example of a reflection nebula. Emission nebulae do not simply reflect light, as does a reflection Nebula, but emit light from ionised gas. Since the most common source of ionisation is high-energy photons emitted from a nearby hot star, emission nebula are often also reflection nebulae. The colour of an emission nebula’s depends on both the level of ionization and the nebula’s chemical composition, which can be determined through spectroscopy. Emission nebulae are usually composed mainly of hydrogen – usually around 90 per cent – with helium, oxygen, nitrogen, and other elements accounting for the remaining 10 per cent. Herbig–Haro (HH) objects are a type of emission nebula, common in star-forming regions, formed when narrow jets of partially ionized gas ejected by young hot stars collide with nearby clouds of gas and dust at speeds of several hundred kilometres per second. The term planetary nebula is something of a misnomer, since they have nothing to do with planets. The name simply refers to the fact that they appear as a round disk of light, similar to the disk of a planet, through a small telescope, rather than a simple point of light, like a star. A planetary nebula is, in fact, a type of emission nebula formed when a star sheds material into space, which gradually spreads out around it. This could be because the star has a particularly strong stellar wind, such as some types of Wolf-Rayet stars. The Ring Nebula (M57 / NGC 6720), in the constellation of Orion, is a good example of a planetary nebula. These nebulae are formed in supernova explosions. The resulting nebula will often have a neutron star, a pulsar or a black hole, at its centre, although certain types of supernova explosion leave no central remnant. M1 (NGC 1952), the Crab Nebula, in the constellation of Taurus, is an example of a supernova remnant.